Hedges are very popular with gardeners – they are used for decorating the farm buildings for protection against the cold North winds, the dust and noise of the city streets and the highway. Depending on the region, plant selection for hedges will vary, but one condition must prevail in any case: the plants should create a dense green wall that hides from prying eyes garden. living walls have a height of over 2.5 meters. 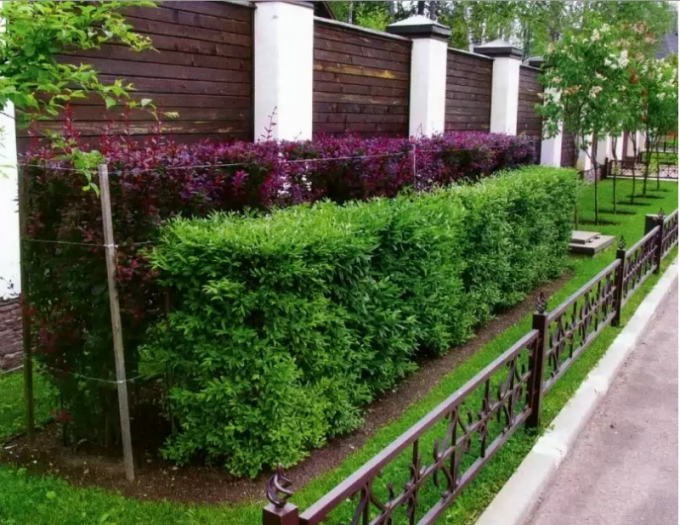 In regions with harsh climates, including in the Urals, in Siberia to create a border of hedges using plants that can withstand a significant drop in temperatures and heavy snow. For landings use Potentilla dahurica or shrub, barbarisi, ornamental species of currant, willow, almond, Japanese quince. These shrubs can be trimmed, forming the shape of the fence at the request of the grower. They are decorative and in their natural form. For medium-high hedges use acacia, cotoneaster, physocarpus, common and Hungarian lilac, honeysuckle, dogwood white. Beautiful flowering hedges of old roses, wild rose, mock orange and lilac. If you want to create a high hedge, it is possible to use the Irga, maple or Apple-shot. Impressive will look of the Ussuri pear, hawthorn, buckthorn, elderberry, viburnum, mountain ash, lilac and mock orange. A very decorative hardy vines: Chinese Magnolia, parthenocissus, perfoliate honeysuckle, hops. To create hedges of these plants you need to keep in mind that they require support. Expanding, they create a gorgeous decorative wall, which at the same time does not occupy much space and does not Deplete the soil. These plants are more preferable for small garden plots. When planting hedges, you need to understand that they grow in one place for more than a decade, so you need to carefully prepare the soil, fill it full of mineral and organic fertilizers, deep to dig the land and to exterminate weeds. More impressive look of the fence, planted in two staggered rows according to the scheme 20 x 50 cm, This distance may vary depending on seedlings. For landing you can use plants with a developed root system, but not older than 2-3 years old or fresh cuttings. In this case, fresh green shoots are cut into cuttings with a length of 15-20 cm and planted inclined at an angle of 30 degrees with depth in soil at 10-15 cm the First time, they need plenty of water, after 2-3 weeks the cuttings are formed of fresh roots. To hedges adorned the street, you need to remove old branches and to cut the fresh growth to 1/3 of the length. In this case, stimulates the growth of side shoots and planting will be more lush.